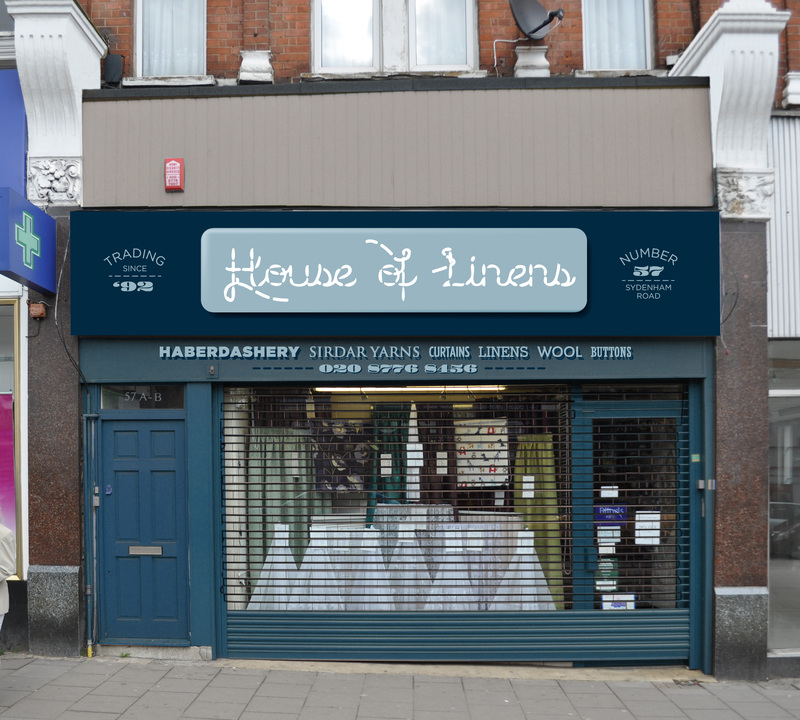 We popped into ‘House of Linens’ a little while ago to get a few bits and pieces (we are going eco and are now fixing old clothes and buying ‘vintage’) and met the very friendly owner. He was talking about Billings so we told them about the What if Sydenham Project. He looked all excited and rushed us outside to look at this sign which he wants to redo. We have been really busy and the few times we have had chance to pop by we haven’t seen him in the store. So before we show them what we have come up with I thought it best to get some feedback on this. More sophistcated colours, the ‘stitched’ logo is on a raised enamel panel (about £400) on a wooden background with Vinyl applied lettering in gloss to make them look as if they are hand painted. The security grill and door etc have been painted to match the sign. We aren’t sure when the business started trading in Sydenham but it’s been here a long time and the owners wanted to communicate this, hence the ‘trading since ’92’. Or we could add an awning and raise the sign above. 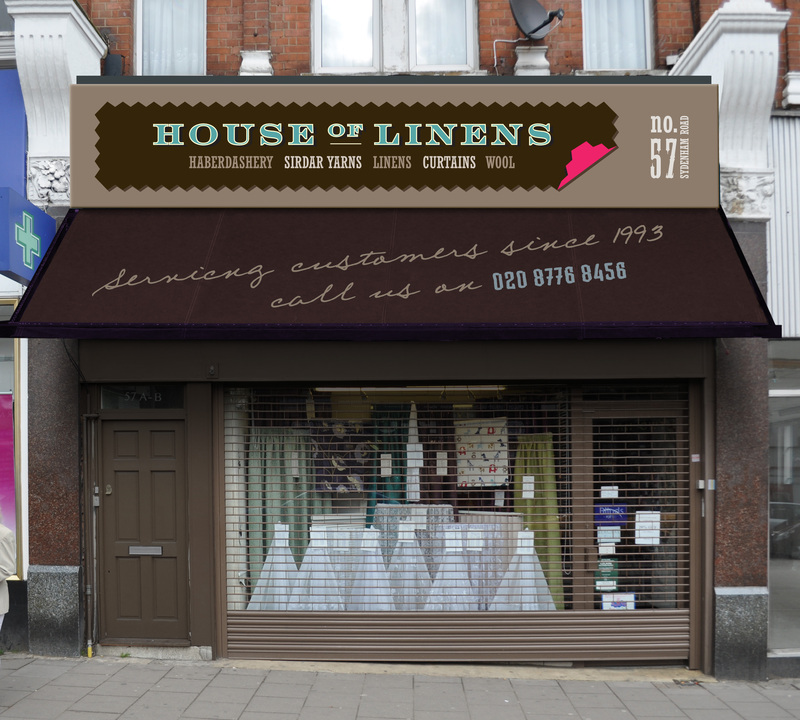 The awning costs about £1300. The sign is based on a fabric swatch with the turned corner in a shocking pink to catch the eye. 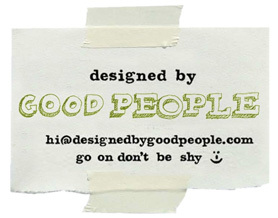 Again the design is retro with a twist and uses more sophisticated colours. 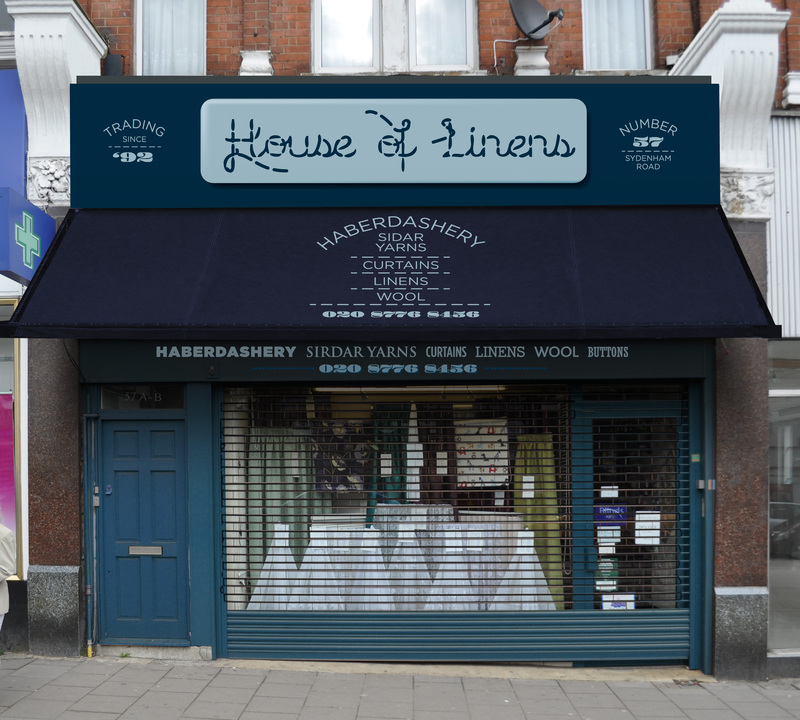 So which one feels the most like a small, family run, haberdashery that has been trading locally for many many years? If you comment please say if you use House of Linens. For more feedback visit the Sydenham Forum or VIrtual Norwood. Fresh and Fruity are linked to Billings (What if No 13) as they are Amo’s parents. Infact without their help, and the help of Annabel and Tim from the Sydenham society Billings may never have happened. Since then we have been incredibly busy and the What If Project has taken a back seat, despite lots of local businesses asking for their makeovers. Unfortunately we have to pay the bills as we fit these in when we can! We have been promising this for a while, so I though I’d post it here, get some feedback before presenting onto them. It’s been a while in the making! This was in the South London Press in July 2010. It’s the second time we have been featured in the newspaper. Good publicity for Amo, the owner, and us. Just thought I’d throw this out there for comment. If the Nabourhood centre was covered in the green wall system it would cost between £450 to £600 per m2 (I’ve contacted some companies). I roughly estimate that the nabourhood centre is between 40-50m2 that needs covering. So it will cost between £18,000 to £30,000 to use the green wall system on the nabourhood centre. It reduces heat loss and helps keep buildings cook in the summer. It reduces noise. It’s VERY low maintenance. It stops graffiti. It doesn’t need painting. It encourages butterflies etc. It doesn’t damage the building. I know I’m going got get stick from some quarters which I’m fine with because of the Mosaic, which I disagree with (but I think Valerie has done an admirable job in bringing it to the stages of reality). I simply think it’s worth investigating an alternative. If we think it’s worth pursuing this I will. What do you think? Should I pursue it further? Empty shops are a blight on any high street (although sales of window polish go up). W.I.S. 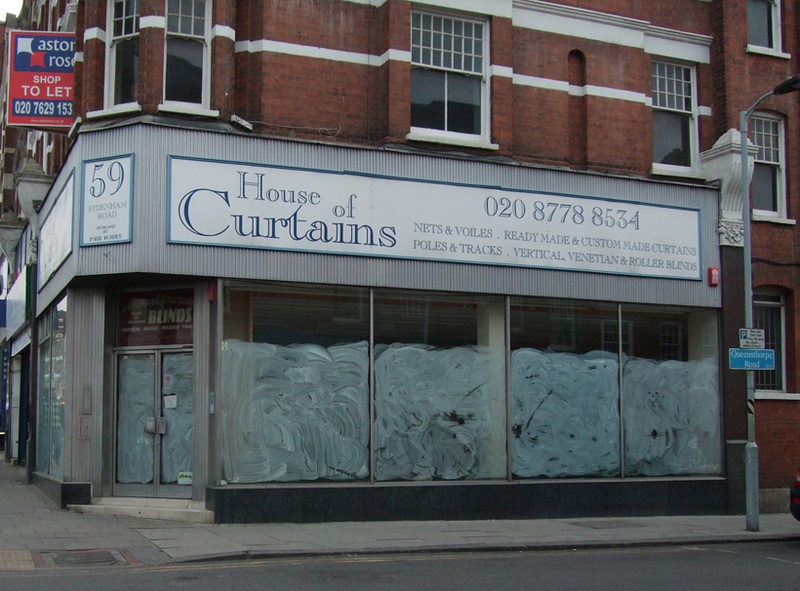 Thinks that owners of empty shops should be forced to ensure that they are presented in an acceptable way. It’s a great opportunity to have art displayed, local history, or as in the case of this ad, history AND an advertisement. 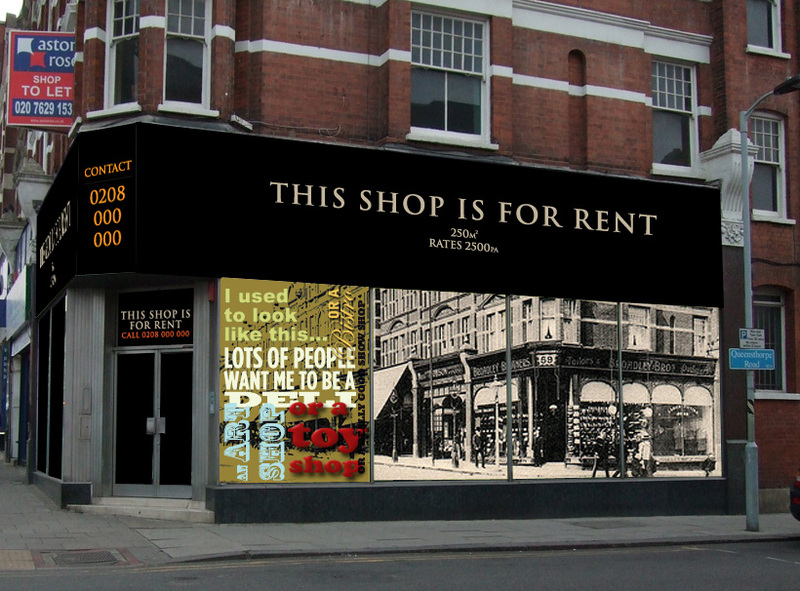 Everyone seems to hate those triangular boards stuck above shops saying ‘shop to let’. 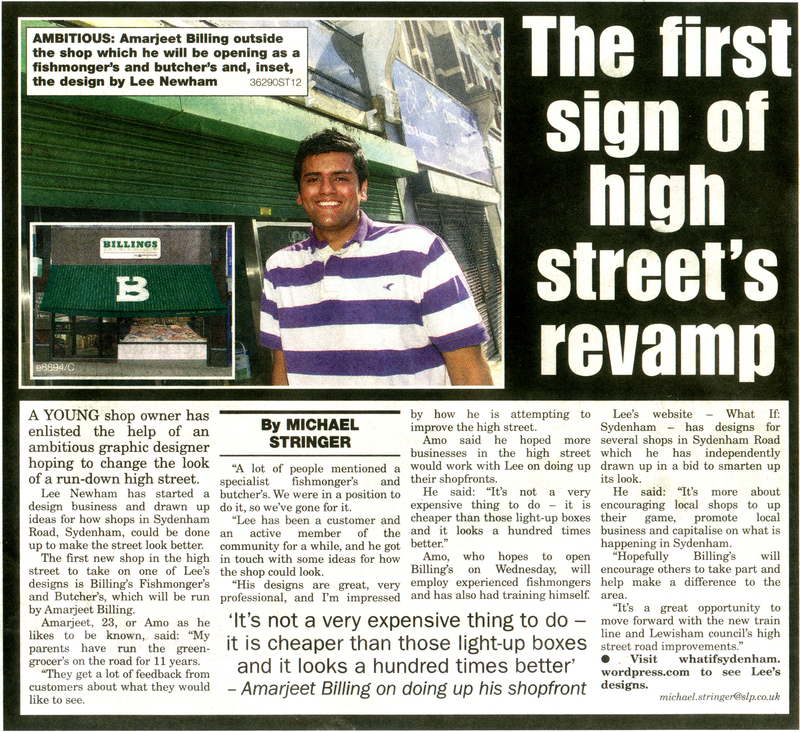 So how can we take something that is a blight on the high street and turn it into something positive? I don’t know much about this new store except it sells gifts. I guess most people know very little about it as it doesn’t have a sign. 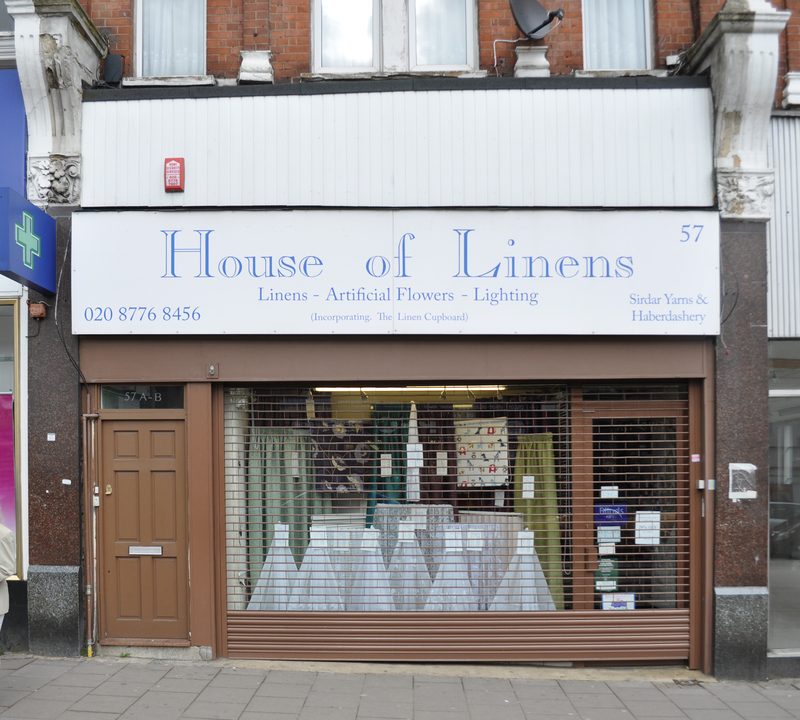 When the shutters are shut it doesn’t even look like it’s a business. I presume that once this was once one shop. I think it would be wise to live in harmony with Desire next door and make the sign one colour. Otherwise it’s a bit like those houses that try too hard to be different from their neighbours and you get a drainpipe painted in two different colours. 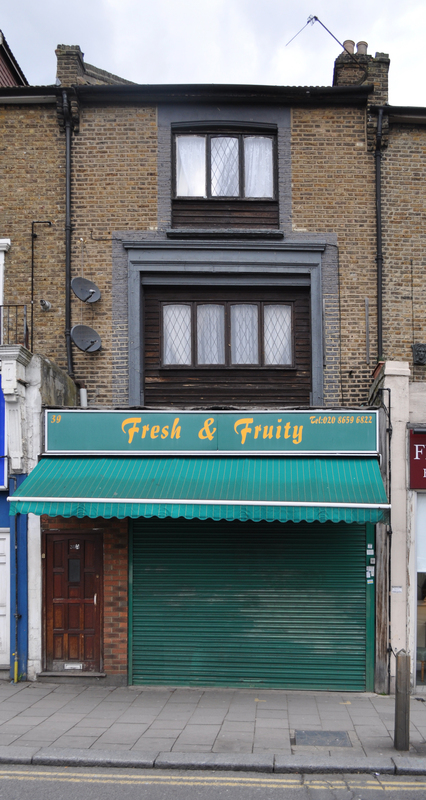 One other pet hate of mine are roller shutters that completely cover the front of the shop. They make high streets look like prisons. But you can turn a negative into an advantage by painting it.